Keep your internet service online with it's assigned IP address: When using two or more servers inside EUserv's datacenter it may be necessary that an IP address has to be used on multiple servers. This function can be implemeted with EUserv's Failover-IP service. What is the Failover-IP service? A Co-IP address is always bound via MAC address and assigned IP to a dedicated server. With the Failover-IP service it is possible to use one or more IP addresses of a server on one or more additional servers within a customer account (=customer ID). So the affected IP address and the underlaying internet services can kept online without DNS changes. What are the advantages and applications for the server-admin? If a server A hosts multiple services is busy and another server B in the customer account still has free capacities a Failover-IP, which takes over for example the mail server service on server A, can be transferred to server B. Server B will continue the mail server service. Only data and configuration of server A have to be transferred to server B and the IP has to be switched afterwards. Changes, like in DNS, are not necessary and an uninterrupted operation is possible. Prerequisite is that the service on server A is operated with a Failover-IP. If a maintenance or an update of the host server A is performed in the framework of the operation of virtual machines, a VM can be temporarily moved to a host server B to continue the operation without interruption under the same IP address. Once the maintenance is complete, the VM can be retracted with the IP address again. Service interruptions or changes in DNS are therefore not necessary. Prerequisite is that the VM on Server A is operated with a Failover-IP. If server A or one of it´s components has to be exchanged because of a hardware defect, which causes a short interruption by itself, any services can be moved temporarily to a second server without service interruption. Only the copying of the data and the configuration is required. Prerequisite is that the service on server A is operated with a Failover-IP. Each Failover-IP can also be used for the realization of high - availability solutions. Here, a service under a Failover-IP can be started within a few seconds on a second server if the primary server fails. (for example, Heatbeat) Prerequisite is that the customer has configured the service on primary server with an Failover-IP and all configurations and data become permanently mirrored. If multiple websites are hosted on a server A, visitors can be connected to the sites 1, 2 and 3 via Failover-IP1 and the visitors of the web pages 4, 5 and 6 via the Failover-IP2 in DNS to server A. If the server A utilized permanently or temporarily, there is a possibility to rent an additional server B and for example the Failover-IP2 to transfer to the new server B. As a result server A has less load and the visitors of the sites 4, 5 and 6 shall be without interruption redirected to Server B. A prerequisite is that the sites run on Server A with multiple failover IP's. 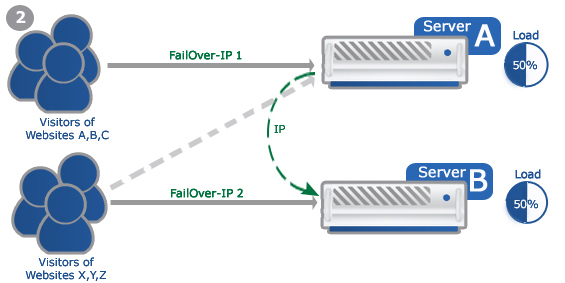 What has to be considered by using Failover-IP? 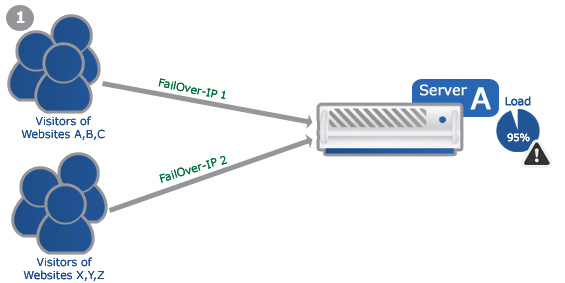 Server with Failover-IP support can connect an IP address maximal to a second server in the same customer account. Both servers must support the Failover-IP function. Server with enabled Pro Option can connect Failover-IP's to more than one other server. Failover-IP is available for IPv4- and IPv6-protocol. Main IP addresses can not be used for the Failover-IP service. Verify that for each of your server plan the use of Failover-IP is possible. If so you assign the desired CO-IP address in the customer panel under the menu "IPv4-Addresses" or "IPv6-Addresses" to the main contract. Please order at least two dedicated servers first, which can use "Failover-IP". Only after activation of these servers, you can use the Failover-IP service. What fees apply for Failover-IP?